Does anyone know where I can find a fitted car cover for my 240z? Used or new. I already have a el-cheapo from the local parts store. I'm looking for something nicer and more fitted to the 240z. I'm considering the BRE car cover, but, I don't really need the weatherproofing. Just something to cover from dust inside my garage. Thanks. I have the BRE cover the price is fair and it is correctly fitted to the car. 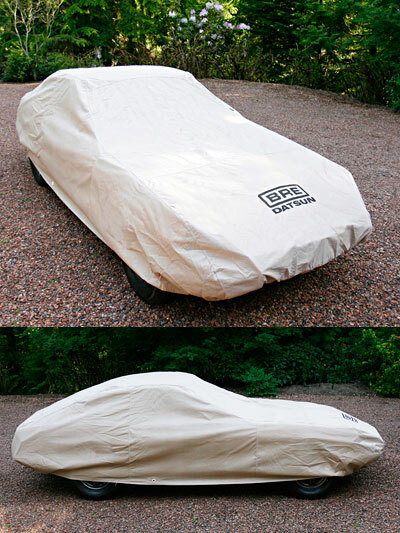 I'm considering the BRE car cover, but, I don't really need the weatherproofing. Hey, that's one of my cars! The Brock's needed a 240Z to photograph the cover on when they lived in Redmond so I let them use my 72 240Z. I bought the cover afterwards. I also have this one from MSA which is cotton with flannel on the inside and just for inside use. Much softer, but also much heavier and a little more expensive. Nice, thanks guys. After doing some searching, it does look like this is priced fair and a good quality item. @Mike B, I'm surprised they didn't just give you the cover for acting as a supermodel for a day. Edit: Oh, I didn't know MSA had one too. I'll have to check that option as well..
@Mike B, I'm surprised they didn't just give you the cover for acting as a supermodel for a day. Yeah, it didn't quite work out that way (I paid full price), but I did get Pete to sign a few things for me. They just lived a few miles away, so I went over and helped them with a few things from time to time. Try Covercraft on line. They have many different fabrics in standard, semi fitted and fitted. I've bought several over the years from them and always was pleased with fit, quality and price. Mike I have this cover and like it. It is soft and easy to out on or off. Folds up small. I have never left it on outside of the garage so cant speak to how it handles the weather.